If your question is not specifically answered on this page, we encourage you to visit Echo's online knowledge base which includes much more detailed information and guides. LR+ is an agile and dynamic learning environment that offers multiple benefits to both the instructors and learners. To view the integrated student engagement tools, compare learning with and without LR+ and to choose the implementation strategies for your class, click here. What are some of the key features that can help me get started? Dashboard – Shows an overview of all courses for which you have instructor access. The instructor can also view if students have posted any new questions or identify students who are falling behind class and look at the overall engagement data of the course. You can also review past classes or prepare for the upcoming class. Library – Displays a list of all resources that you have uploaded to LR+ or resources that have been shared with you. Courses – Displays a drop-down menu of all courses that you can access. Classes – Lists all the lectures of the course. The term used by LR+ for lectures is classes. Q&A – This is used to post questions to students, endorse questions and respond to their questions or discussions. Analytics – Provides real-time data on how students are engaging with the resources in the class. This can be viewed as the whole class or for individual students. Settings – Can be used to enter more details and descriptions of the course. Interactive slides with embedded activities. Discussions panel allows instructors and learners to post questions and endorse answers that are correct or highlight questions that need more attention. Note that when learners post anonymously, the details of the person are only anonymous to the class and not to the instructor. Confused flags allow learners to indicate confusion over slides or any part of the video. This can be viewed later in the Analytics. Can I access my past recordings from ESS? Yes. All content from the old ESS system has since been migrated to LR+. ESS was decommissioned in December 2017. Which venues are suitable for LR+? To view the list of venues that are enabled for lecture recording, please click here. How can I update schedule information? For timetabled courses (except Medicine and Law faculties), please contact your school/faculty timetabling officer. Instructions on how they can do this can be found here. Login credentials will be the zID and zPass. For courses within Undergraduate Medicine (MFAC) and Non-Timetabled (Ad-Hoc) recordings, please contact the IT Service Centre. Can I opt out of recordings? How do I opt out of recordings? Kensington, Paddington and UNSW Canberra (Except Faculty of Medicine and Faculty of Law) Please contact your school/faculty timetabling officer. Instructions are available on the Learning Space Confluence site. Kensington - Faculty of Medicine Please send a request to the IT Service Centre. Note: To cancel one-off recording requests (i.e. Recordings outside of normal teaching times) such as guest speakers, special events etc. As these are scheduled by the IT Service Centre, you must contact them to arrange for such sessions to be cancelled if required. What policies should I be aware of when using LR+? Click here for more information on these policies. How long after my lecture should I expect my recording? When a lecture is completed, the capture appliance in the venue must finish the raw file, process it into a more usable format, and then upload it to cloud servers for additional processing. Once complete, it will become available in your interface automatically. As lectures generally start/stop at the same time, a large number of lectures go to the servers for processing at the same time, particularly at peak times of the day. While the size of the queue can impact how long each lecture takes to process, but the cloud will detect lengthy delays and automatically spring up additional servers to deal with the queue on the fly. The size of the lecture and video content determines how long it will take to process, but its usually available within a couple of hours. We generally recommend waiting > 24 hours before raising any incidents. This is because when a processing issue occurs, the service has it's own self-healing capabilities, and one of these will restart the full process at the 24 hour mark, which is often successful. How long should my Lecture Recordings be? We recommend that all lecture recordings are scheduled to be 1 or 2 hours of duration, and not longer. For example, a 4 hour lecture could be scheduled for recording as 2 x 2 lecture recordings. Usability - A long lecture split up into smaller lecture recordings can make it easier for students to keep track. Also, and this depends on the course design to be fully effective, each lecture recording can have its own focus and related questions/notes. Reliability - While quite rare, the scheduling of large lecture recordings can result in the entire lecture failing, or in the least having technical issues that prevent its timely processing. Hence breaking them up into smaller lectures will improve reliability and faster processing time. Note, UNSW's lecture scheduling policy will mean a 5-10 minute gap will exist in between lecture recordings. While this is generally designed to give students the ability to leave one classroom and arrive at the next, it is also required to ensure back to back lecture recordings are completed successfully. Without this gap, the capture appliances may not finish the previous lecture recording processing, and thus fail to start the next lecture recording. Consequently, we recommend that the scheduling gap is managed through the use of a short break at the 2 hour mark. What should be done if I have multiple roles in an LMS? If you are an instructor as well as a student in your institution, you can change the role from an instructor to student using the menu bar of LR+. Note that LR+ and Moodle are two different platforms. Click on your name on the top right hand corner of the menu bar. When and how can I use analytics? What interested students the least etc. Further details on the Analytics available for instructors can be found here. Can I utilise the interactive features of LR+ for my tutorials or for a class other than that of scheduled lectures? Yes, however, note that creating a class on ALP does not schedule a recording automatically. You can use the "New Class" option of LR+ to use its interactive abilities. For more information on creating new classes, please click here. What should I do if I link an incorrect lecture recording to my course? You will be able to link to the correct course or delete links to an incorrect course by clicking on "Reset Moodle Link" located in the "Classes" tab of your course. Once this is done, you will have to navigate back to the course main page and click on the LR+ activity to link to the correct course. How can I share my lectures in Moodle? The lecture recordings are automatically available to students if this has been opted for, in myUNSW. You will need to add the Lecture Recordings+ activity in your Moodle course so that students may access the lectures. Further details on how to share the recordings for students on Moodle can be found here. Can students download lecture recordings? Yes. This will be possible if your recordings are configured to Available when complete in myUNSW. Can I modify lecture recordings? Yes. Navigate to the video you want to edit, click on the video icon and select Edit Video. More information can be found here. Can the lecture videos be made unavailable? Yes. This can be configured in the "Availability" settings of the video. You may choose to make the video available to certain students only or after a certain date. More information can be found here. Does Echo360 have a screen capture option? Yes, Echo360 provides a free stand-alone application Universal Capture: Personal that runs on either Windows or Mac and allows you to create recordings to supplement your in-class materials. More information on how to install, configure, record and upload can be found here. How can I sign into Echo via the Microsoft PowerPoint Ribbon? You must first create a direct Echo360 password, prior to being able to sign in via the Echo Microsoft PowerPoint ribbon tool. Detailed instructions may be found on the following page underneath Teaching with presentation slides. Will animations and transitions in my PowerPoint work on ALP? Unfortunately, all animations, transitions, equation and molecular structure generating abilities will either be lost or altered when ppts are uploaded to ALP. However, this can be avoided if you present your lecture using the normal ppt instead of uploading it to ALP. Since LR+ will record the screen on the primary projector, you can deliver the lecture from a ppt file in your storage device (USB or desktop). You may also choose to use the ppt slides and the interactive activities of LR+ simultaneously and this will be recorded accordingly depending on the content that is projected on the screen. In addition, you can also download the ppt ribbon (windows users only). This will allow you to maintain the animations, transitions and other builds while delivering presentations using LR+. To download the ppt Echo ribbon, click here. How can I upload my ppt presentation to the LR+ platform? Navigate to the class to which you want to attach the ppt. Click on the add presentation button and upload from a storage device. Note that a class on ALP can only have one ppt presentation. Can PowerPoint slides be edited from the ALP site? Yes. LR+ allows you to add/delete slides, add media slides or add an activity slide. Can I embed interactive activities in PPT slides? Yes, the following activities may be added to your presentation. How can I sign into the Echo360 mobile app? Download the latest Echo360 application from either the Apple Store, Google Play or Windows Store. Once installed, the app will request you enter your school assigned email address. Please enter your primary UNSW email address within this field. 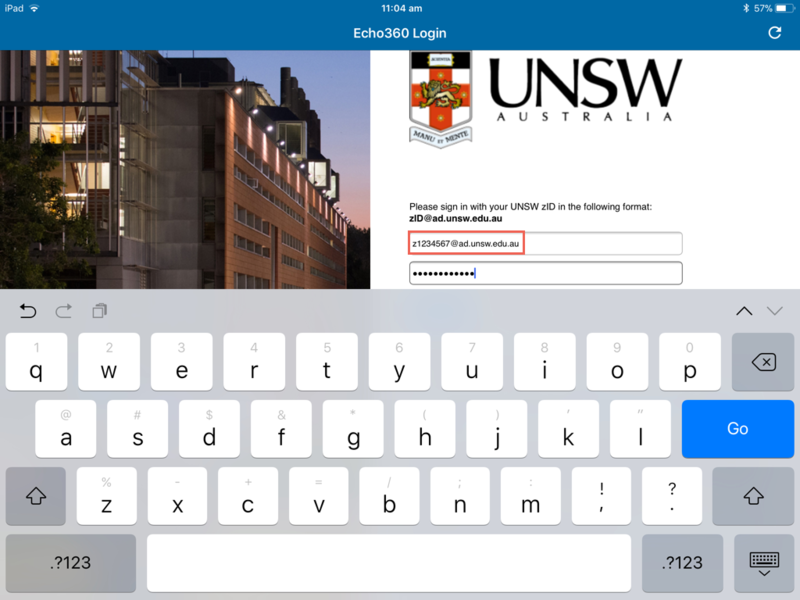 Once confirmed, the app will redirect you to UNSW's authentication page where you can then sign in. How can I switch roles within the Echo360 mobile app? If you have multiple roles within Echo, upon signing in via the app, it will prompt you to select the role you wish to sign in as. To then switch roles, you must first log out of the application and sign back in. To log out, select the 3 horizontal lines icon located on the top left of your screen and select logout. UNSW Lecture Recordings+ (LR+) is an educational technology that supports engaged learning in lecture-based courses, flipped classrooms, and blended or fully online courses.